Posted on October 7, 2013 by izzy Posted in Uncategorized	. It’s never been trendier to have an extensive collection of board games (at least in the circles I run in). In the parlor of any given alpha-nerd, you might find ‘Settlers of Catan,’ ‘Dominion,’ ‘Munchkin,’ ‘Zombies! !,’ ‘Ticket To Ride,’ ‘Cards Against Humanity,’ or any number of kickass tabletop games. What I bet you won’t find, however, is Battleship. 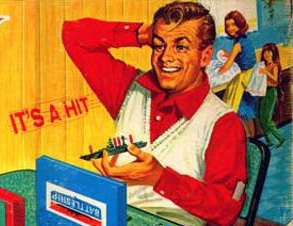 We all had a set as kids, but for some reason, they all got left behind at Mom &/or Dad’s. This could probably do with an update. I think we can all name reasons why Battleship might not be worth pulling out of the family game closet. Chief among them is the fact that there is a dominant strategy: essentially, the winner (on average) is the person who performs a binary search of the space, punctuated by seeking out the un-bombed portions of the ship you have found. Once both players understand this, most games will be suspensefully close, but not require a lot of planning or skill. Recently, I was re-reading ‘Cryptonomicon‘ by Neal Stephenson, and it occurred to me that the true problems of WWII-era codebreakers, upon which the book is partially based, suggest an incredible expansion to this WWI-era game. I call it the Enigma Expansion, because it involves mild codebreaking and information theory, and also because it has wheels. 1. 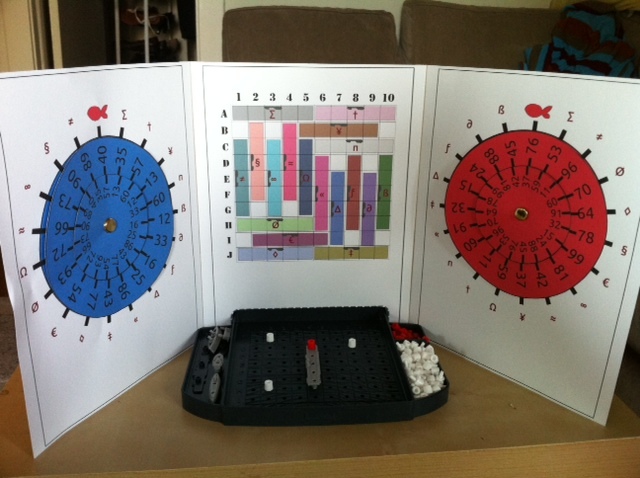 A commercial battleship set or one piece of graph paper per player. Each player may also wish to have a pad and pencil so as to record previous guesses and positions. I made it so the tri-fold would fit over the commercial Hasbro battleship set. The outer wheel positions (outer blue wheel and outer red wheel) represent the player’s own codes. 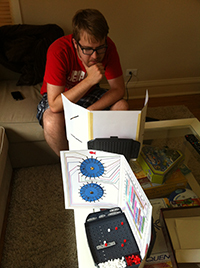 The inner wheels are tools for the player to figure out their opponent’s codes. You’ll also notice that the Carrier is the only ship on the field. In the Enigma expansion, the Carrier is the only ship in play. It’s also important to note the symbols around the outsides of the code wheels, which each correspond to a carrier location shown in the center. Before the game starts, each player must turn her outer code wheels to a random position. These code wheels won’t move for the rest of the game. Each player then puts their Carrier anywhere on the grid that they like. a) Fire on her opponent by calling out a letter and number defining a position on the board. As in the normal version of Battleship, her opponent must then tell their opponent whether the shot was a hit or a miss, and place a red peg in that location on the ship. If a spot on the Carrier is hit twice, it has to be called out as a “hit,” but no additional peg needs to be placed. There is one special position on the top of each code wheel which is marked by a red fish. This is the ‘red herring.’ If you want to make your opponent think that you’ve moved, without actually moving, you can use the code corresponding to that position. Those are the only rules, but there gets to be a fair amount of strategy. Guessing where to fire becomes as much about psychology as search (would they move far away, or close by?). Figuring out when and where to move in order to give your opponent as little information about your code wheel as possible. You can also narrow down the position of your opponent’s code wheels by noting when they’re forced to move, but you obviously shouldn’t let your opponent know how much you know about their codes. PR guy Ryan Olsen sizing up his next move in an earlier version of the game. This is where the historical parallels come in. For one thing, codebreaking is a lot easier when you have context clues about what the message contains – like approximately where your opponent was. Also, one of the most important and often-overlooked parts of codebreaking is not letting the other parties know that their code is compromised (because obviously they’ll then stop using that code). That’s why there are two codes, red and blue. If you think your opponent knows one of your codes (for example, if you’ve been hit just after using a code), you can just abandon it and use the other. This expansion has gone through quite a lot of iterations, focusing on different parts of the process, but this one is by far the simplest and truest to the spirit of the original game, while adding enough complexity to keep it engaging. I’ve attached the image files for the setup here: Enigma Expansion, and I hope you’ll give it a try. What’s next for this expansion? I have no idea. I’m not really even savvy enough to know where to post this on the web so that other board game enthusiasts can try it. If you have suggestions regarding what I should do next, please let me know in the comments! Many Thanks to Ryan Olsen, Gerald Kelley and Kevin Zuhn for playtesting with me. I’m Rob Lockhart, the Creative Director of Important Little Games and I’m working on a game that teaches programming called Codemancer. If you were to follow me on twitter, I’d be grateful.